Researchers at Wake Forest University have created something which could change the way that smartphones and tablet devices are charged. 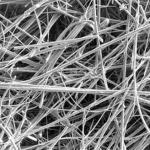 Called Power Felt, this newly invented fabric is composed of tiny carbon nanotubes locked into flexible plastic fibers. These fibers are able to use temperature differences to create a large enough charge to power up a smartphone.